When it comes to enjoying the best that outdoor Great British life has to offer, Wales is undoubtedly the place to be. With soaring mountains, stunning coastline and a whole load of adventure activities to set pulses racing, Wales is the ideal holiday destination for visitors from the UK and overseas. 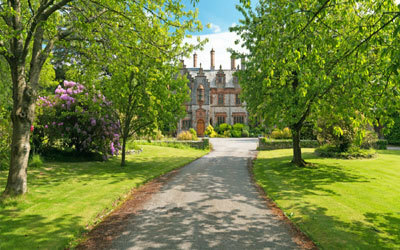 Liggett knows Wales well through her company, which is offering hotel room investments at the stunning Caer Rhun Hall. The hotel is located in the heart of the Conwy Valley, set in 20 acres of breathtaking grounds, with beautiful countryside stretching for miles around. Built by General Hugh Gough in 1892, the three story mansion is a traditional countryside delight, featuring crow-stepped gables over the bays, a slate roof with heavily ornamented roofline, towering chimneys and thin columnar finials topped with stone balls. The market town of Conwy is just 7km away, with its pretty beach, majestic castle, ancient walls with 22 towers and the smallest house in Great Britain offering a delightful range of sights and family activities. Further afield, the surrounding Llandudno countryside is awash with everything from classic seaside pursuits at Blue Flag beaches (think piers, Punch and Judy and small tots balanced on donkeys) to art exhibitions and theatres. The whole of the Snowdonia National Park is also easily accessible, offering some of the most picturesque scenery in Great Britain, as well as the opportunity to scale one of the UK’s most famous mountains. Such a wealth of activities makes hotel investment in northern Wales an attractive prospect. Investment at Caer Rhun Hall is from £50,000, with a range of luxurious rooms and villas to choose from. Investors can benefit from a hands-off, fully managed investment with 10% returns per annum, 125% assured buy-back option and even two weeks’ personal usage per year. Wales is already enjoying a booming reputation as an international tourism destination. The country was included in the Rough Guide’s Top 10 Countries 2016, which promised that, “culture vultures, foodies, festival junkies, adventurers, hikers and extreme sports enthusiasts will be spellbound here.” Now, with investments like Caer Rhun Hall offering a low entry point and excellent returns, investors in Wales can be spellbound too! For further details, visit propertiesoftheworld.co.uk.